Jack rear-facing in the Britax Marathon at 3 years, 1 month and 2 days. This was Jack's last day rear-facing. 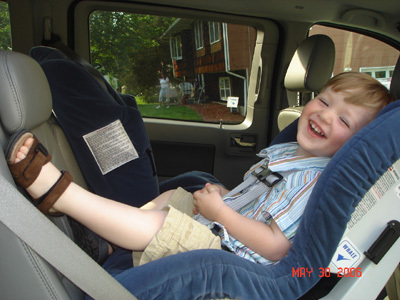 He had to turn forward-facing because he reached the upper rear-facing weight limit for the seat (33 lbs). Jack rear-facing in Britax Advantage at 1 year, 11 months old. Jack is 34.5 inches tall and weighs 28 lbs. 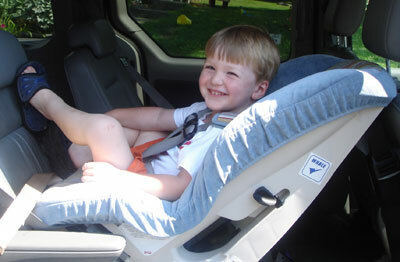 Note: The headrest on the Britax Advantage extends above the top of the seat. 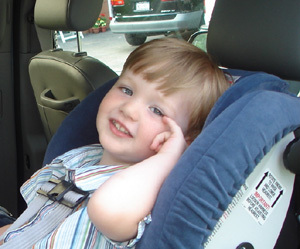 Although the top of Jack's head is no longer under the "shell" of the seat, his head is still well-contained within the extended headrest, giving him extra rear-facing time in the seat.